PRECON composite sheet membrane is comprised of a non-woven fabric, elastomeric membrane, and W. R. MEADOWS’ exclusive, patented plasmatic core. PRECON’s plasmatic core is a seven-layer matrix providing the lowest water transmission (WVT) rating available. Additionally, PRECON helps reduce methane and radon gas intrusion. Also designed for toughness, once concrete is poured against PRECON and the concrete cures, a mechanical bond forms that secures the concrete to the membrane. PRECON is used as a blindside membrane in vertical application where access to the positive side is limited. 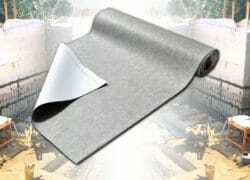 The membrane can also be used for horizontal applications for underslab/blindside waterproofing and vaporproofing. Make the most of PRECON’s impressive features by assuring proper usage and installation procedures. We offer a variety of literature including a product reference flyer, in-depth product brochure, installation guidelines (general, corner installation, soil nail installation), and a cold weather application technical bulletin to assist in accurate and effective use of PRECON.